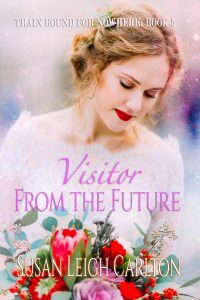 Visitor From The Future is Book 5 of the Train Bound For Nowhere Series. May 10, 1903…A cowhand searching for strays found a stranger in a high meadow. Dressed in odd looking clothes and had a broken leg. Who was the man found in a remote meadow on Mary Catherine’s ranch? How did he get here? Where was he from? May 10, 2017…The charge beneath his seat propelled Jim Bob from the cockpit of his crippled F-15 fighter plane when he pulled the ejection handle. A cowboy on a white horse approached. If he was dead, this was a weird looking angel. How did he get from 2017 to 1904? Can they overcome his reluctance to acknowledge their feelings for each other? Can the past and the future wed?